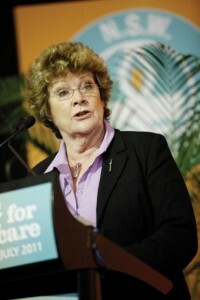 In her address to the NSWNA annual conference, the new Health Minister Jillian Skinner said her Government would honour the gains won by nurses in the last Public Sector Memorandum of Understanding but was defiant in her support for the Government’s new wages policy.‘The O’Farrell Government is committed to meeting the agreements (negotiated by the NSWNA with the previous Labor government) including patient ratios and wages,’ she said. The Minister batted away delegates’ strong concerns about the Government’s IR laws. ‘I’m not against negotiating increased productivity for increased pay,’ she said. Ms Skinner said one of her highest priorities will be dealing with the culture of bullying in public hospitals and that she had asked for a redrafted staff code of conduct. In response, NSWNA General Secretary Brett Holmes said the weakening of the IR Commission and the attack on nurses’ wages would not go unanswered. ‘Our members will continue to fight for their rights through the restoration of arbitration,’ he said. Brett was scathing of the Government’s and NSW Health’s feeble attempts at recruitment of the extra nurses required to meet the ratios. ‘The system is aimed at delaying recruitment and seeing if people can do without,’ he said.